The first issue of American Avatar came out in October 1968. The cover shows "OCT 50¢" in the upper right corner, and "Photograph by Mel Lyman" at the bottom. (Michael Kindman identifies the woman on the cover as Paula Press.) 10 1/4 x 13 1/2 in. (26.2x34.4 cm), 28 pages, including covers, unnumbered except for pages 24 and 25. No masthead, no table of contents. Because we are no longer a newspaper, or a magazine, but simply Avatar - which includes the purpose of both and much more - we may not work on any deadline or date of publication. In the future Avatar will be published monthly by the dictates of events we have no choice but to define. We will accept no classified information unless it is relevent to the order of each issue. We will accept no advertising whose layout can not be brought to the level of our own. We will accept all donations from those who can distinguish the standard which we have set to speak the truth. Page 5:WHEN WAS THERE GREATNESS IN HISTORY? The second issue of American Avatar came out in November (?) 1968. The cover shows "1.00" in the upper right corner. (Michael Kindman identifies the woman on the cover as Faith Gude.) 11 7/8 x 14 7/8 in. (30.2 x 38 cm), 36 pages, including covers, unnumbered. No date, No masthead, no table of contents. 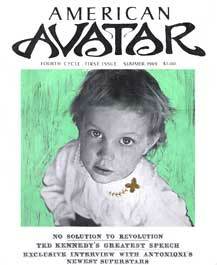 "A subscription to American Avatar is ten dollars for one year (twelve issues). Be sure to include zip code with your mailing address. A special Editor's Choice collection of back issues is available at ten dollars per set. It includes the best of our past work. Make checks payable to: American Avatar / 5 Fort Avenue Terrace / Roxbury, Massachusetts 02119"
Page 4: "When was there greatness in history?" Our purpose was stated in last issue, it is created in this one. The widely varied forms of expression in this publication over its first year and a half have brought us this far, the need for expression has only become greater. We are creating a new world. 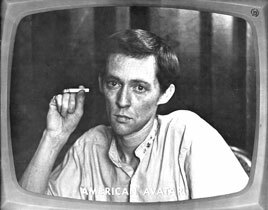 We begin with ourselves, we extend ourselves to the immediate world around us, American Avatar brings us to you. We're not foolin', but we'll not be dismal either. We have nowhere else to go, we have nothing to lose, we want only to talk with you in the best form we know. To speak in a magazine as beautifully as we sing, to make music through these pages, requires the care and exactness of layout Avatar is known for, it requires the highest quality printing, it takes money, it takes continuing expansion of readership. We give up everything we have, and make more of ourselves to give away ---- All toward the same single purpose ---- will you do as much? We need to have more people know about us, we need more ways to do that, we need contributions, we need a national distribution. And you need these things too, for you need us, just as we need to do what we have to do. Avatar is the compassionate conscience of America. Nobody likes their conscience, but everybody has to deal with it. The third issue of American Avatar came out in early 1969. 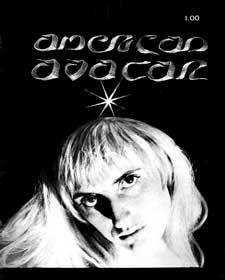 There is no price or other writing than "American Avatar" on the cover. (see Michael Kindman on this issue.) 14 1/8 x 11 1/4 in. (36 x 28.5 cm), 28 pages, including covers, unnumbered. No date, no masthead, no table of contents. A subscription form: "Well Folks - right now we are publishing a magazine, but later on anything is possible - whatever it is, we'll send you at least one of it, every time we do it. Please send $10.00 to: American Avatar, 27 Fort Avenue, Roxbury, Massachusetts 02119." 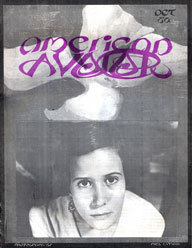 Page 14: "On Mountains", "Contrary"
The fourth (last) issue of American Avatar was dated Summer 1969, the first issue to indicate a year. The cover shows "Fourth Cycle, First Issue Summer, 1969 $1.00" under the title, a photo of David and Faith Gude's daughter Clothilde (see Michael Kindman) and "No Solution to Revolution", "Ted Kennedy's Greatest Speech", "Exclusive Interview with Antonioni's Newest Superstars" at bottom. 11 3/4 x 14 1/4 in. (30 x 36 cm), 44 pages, including covers. This was the only issue with a masthead and table of contents.